. : Here it is... the first time we have ever released a photo before sign up day!!! Here it is... the first time we have ever released a photo before sign up day!!! Here is our 100 Club Quilt! We just love it! This year, we decided to make the larger version (we always offer an option to purchase an extra kit to make your quilt larger) so everyone would get a good feel for what the big fella looks like! Your 100 Club Quilt measures 9 blocks by 11 blocks ( half churn dash and half solid blocks ) that will make your quilt measure 54 inches by 66 inches. We have two extra kits for sale... the first one includes extra churn dash and solid blocks that will make your quilt 13 blocks by 15 blocks (78 inches by 90 inches). 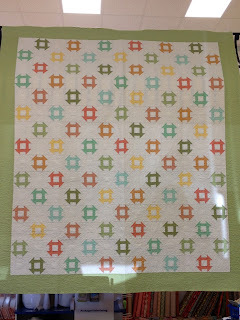 The second extra kit is a six inch border that would make your quilt finish at 90 inches by 102 inches. The best part... you get to decide! You may leave your quilt as is, choose our extra block kit, choose our border kit or do anything you wish... we will help you figure out a plan! As an extra bonus this year, for every month you bring your completed blocks back to show us, you will have your name entered into a draw to win a great prize! OH, YUMMY....can't wait! trying to make this decision is like asking a child if he/she wants 1 scoop or 2 scoops ice cream! C U Friday! !